On the morning of Monday 12 October, Index on Censorship will be teaming up with Policy Exchange and Google to discuss free expression and the Internet. Later that day, Liberty and Index on Censorship will stage Protest! 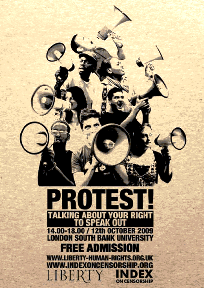 an exciting event encouraging students to exercise their right to free speech, with special guest Sir Hugh Orde, head of the Association of Chief Police Officers. Why, people might sensibly ask, is Index on Censorship engaging with one of the world’s leading technology corporations and one of Britain’s top police chiefs? The answer is because we no longer see free expression only through the traditional prism of outright state censorship of or violence against writers and journalists.